Senegal coach Alain Giresse has included Sadio Mane in his final squad for the 2015 Africa Cup of Nations despite his calf injury. 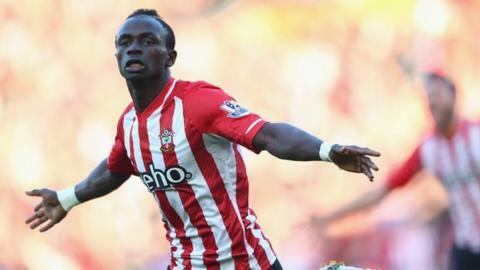 Mane's club, Southampton, have said the player's injury will keep him out of action for four to six weeks. Giresse says he is willing to take the risk in the hope Mane, 22, can recover. The coach also said if necessary he will make use of the rule that allows an injured player to be replaced up to 48 hours before their opening match. Mane is set to meet up with the Teranga Lions in Morocco to attend their training camp in order to be assessed by the Senegalese medical team. Italy-based pair Boukary Drame, who plays for Atalanta and Inter Milan's Ibrahima Mbaye have been dropped from Giresse's provisional squad of 28 players. The other two players to miss out are Diambars goalkeeper Ousmane Mane and the injured West Ham striker Diafra Sakho. Senegal begin their Group C campaign in Equatorial Guinea against Ghana on 19 January. Goalkeepers: Bouna Coundoul (Ethnikos Achnas FC, Cyprus), Lys Gomis (Trappani, Italy), Pape Demba Camara (Sochaux, France). Defenders: Zargo Toure (Le Havre, France), Lamine Gassama (Lorient, France), Lamine Sane (Bordeaux, France), Kara Mbodj (Genk, Belgium), Pape Ndiaye Souare (Lille, France), Papy Djilobodji (Nantes, France), Cheikh Mbengue (Rennes, France). Midfielders: Cheikhou Kouyate (West Ham, England), Pape Kouli Diop (Levante, Spain), Idrissa Gana Gueye (Lille, France), Stephane Badji (Brann, Norway), Salif Sane (Hanover, Germany), Pape Alioune Ndiaye (Bodo Glimt, Norway), Alfred Ndiaye (Real Betis, Spain). Strikers: Moussa Konate (SC Sion, Switzerland), Mame Birame Diouf (Stoke City, England), Sadio Mane (Southampton, England), Moussa Sow (Fenerbahce, Turkey), Papiss Demba Cisse (Newcastle, England), Henri Saivet (Bordeaux, France), Dame Ndoye (Lokomotiv Moscow, Russia).